Blog January 20, 2019 0 Milan A. We are living in a time when pollution is over the roof. Many things we use or do are posing potential harm to our home air. You are afraid to open windows because the air outside may be worse than the air inside. But how can you be sure? The only way to be sure about the air quality is to do the air quality testing. Now some people have bought air purifiers with air quality monitoring, and they are somehow safe and know the air quality in their home, but all other people need to test the air quality. 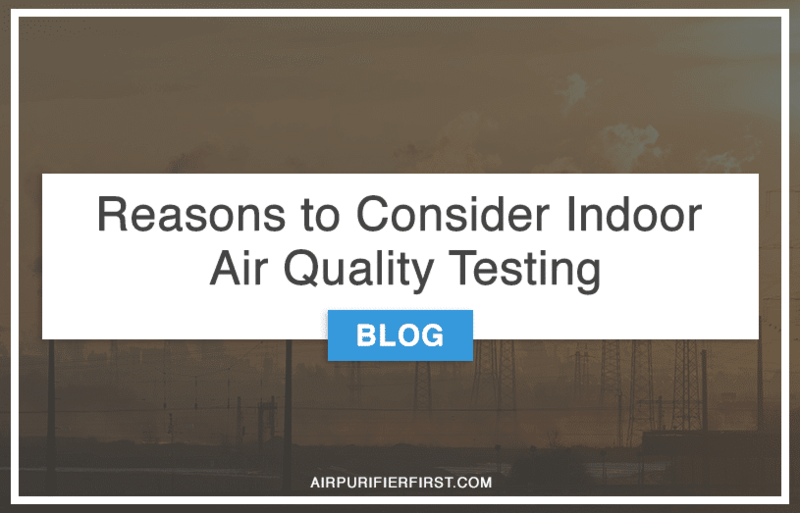 There are many reasons why you should consider indoor air quality testing, many of the reasons are not visible to a naked eye, but there are some reasons that will tell you that it is the time to either buy an air purifier or do the air quality testing. VOCs are the most dangerous compounds you could have in the home. If you paint walls, install new carpet or place anything that is smelling weird then there is a high chance that these things are emitting dangerous VOCs. Things like new furniture may be deadly for your lungs. With time VOCs go away, but how will you know when the perfect time to enter the home is? The only way you can be sure is by doing an air quality testing. The major problem is carcinogenic formaldehyde which is found in wood, tobacco smoke, gases, fabric, burnt food and many other components which are flying through the air. If you are exposed to formaldehyde for a longer period, you can have serious health problems. Invisible gas carbon monoxide kills millions of people every year in the world. And the interesting fact is that mostly people in developed countries die from this deadly gas. Problem with CO is an open fire in a sealed room. Oxygen is burnt, and CO is released in the air and by keeping open fire levels of CO can grow to a dangerous point. You won’t notice anything, you just go to sleep and never wakes up, that’s why this gas is called silent killer. If you use the stove with open fire or have a fireplace in the room, I can highly suggest you to install CO alarm which will tell you when the CO level is high. And the only thing you need to do to remove CO from the air is open windows and make the air flow. By having an air purifier in the room, you can make the cleaning process faster. Asbestos is not welcome in the home, but unfortunately, old houses have asbestos materials which are deadly to lungs. If you inhale asbestos fiber, you can get cancer or other health problems that can be deadly in the end. Because of that asbestos as a building material is not used in modern homes. But if you are living in an old house, you probably have asbestos parts. Roofs were made from asbestos, and some governments even paid people to remove asbestos from their roofs. If you are unfortunate and have asbestos in your home, the best thing is not to touch it or do anything with it. In solid form, asbestos can’t harm you, but if the fiber gets in the air, you can be in grave danger. If you decide to remove asbestos from your home, please consult with the company that is specialized in this field. Radon is coming from decaying uranium, and as soon as you hear uranium, you remember a nuclear bomb. An atomic bomb is linked with cancer and that what radon does. High levels of radon will give you cancer. Radon is naturally found on the ground, and if your house is not built with concrete, then there is a high chance the radon will get in the home and in the air. Since we are making our houses sealed to keep the warm air inside that is also the problem when a deadly gas gets in the room, it can’t get out, and concentration of the fatal gas raise. Some grounds have more radon than others, especially if you are living near the nuclear bomb testings. Mold spores are invisible, but if you see mold, then you know you have mold spores in the air. Mold spores are one of the few reasons why people have allergic reactions. You could make your home dryer to prevent mold and mold spores. You can also buy air purifier which is a perfect device to fight mold spores. Pesticides are popular because we humans need food clean from insects and the visual view of that food need to be pleasant to the eye. But for that not needed deluxe our homes and air around them are polluted with pesticides. If you live on a farm or near a farm, you must be sure to close windows when farmers spray the crops. In some countries the spray fields with airplanes which is extremely dangerous if you live nearby. Pesticides can also get in your home by using chemicals to fight cockroaches, fly, mosquitos and other unwanted pests that bug us. When fighting the pest make sure you use natural pesticides which are not that deadly to humans. If you see dust accumulating on the floor your air need cleaning or at least testing. Dust is a good visible sign that will tell you that the room is not clean. It is obvious there is dust in the air, but it is also possible that other invisible pollutants are also in the air, and to be sure testing is required. Pet dander is not visible to the human eye, but pet dander is in your home if you have a pet. There is no pet in the world which will not leave pet dander. You can clean your pet often and maybe reduce pet dander in the air, but that is really not the best solution. The only solution to reduce pet dander in the home is not to let your pet get inside the home or by using air purifier which has powers to remove pet dander from the air. Dander can also come from other animals that are living in your home, like a mouse, rats, cockroaches and all other animals which can release feces and body parts. Mold is already mentioned above, and molds on the wall are not really that dangerous. It looks ugly and unhealthy, but the main problem of the mold is mold spores. Mold spores are flying freely in the air and looking for another place to grow a new mold. If you have mold in the room, then you must understand that you are breathing mold spores. Where is mold there are mold spores as well. Air quality testing is not going to tell you much. You will get info about the levels of each compound in the air, but some people can handle higher levels and some will have problems with even the lowest possible level because of that doing air quality testing is going to be subjective. There are no standards that can tell you what is right and what is wrong. And because of that before doing any type of air quality testing, you should check some stuff that may indicate that the air in the room is polluted. If there is leaking water in the room or house, you have a potential mold treat. Mold loves damp areas and as soon as there is perfect level of humidity in the air mold will start growing on the walls. If you see that in your home, the best way is to fix the leak, use a dehumidifier to remove extensive humidity from the air, and after some time you could do air quality testing to make sure there are no mold spores in the air. If you smell a bad odor inside the house, then you can be sure that there is some type of air pollution going on. Smelling a bad odor can force you to do the air quality testing or at least fight the air pollution. But you should know that the deadliest pollutants have no smells and are completely undetectable by human senses. If you have a ventilation system with a job to bring fresh air into the room, then you must make sure that the system is working correctly. It is possible that the ventilation is set in a wrong way and is actually pushing the bad air to the house. If the ventilation is close to the pollution source, then it is highly possible that that pollution is entering your home through the ventilation system. It is best to appoint a ventilation specialist to check the ventilation system and to make sure that it is doing good and not harm. To know exact level of pollution and the type of pollution you need to do air quality testing. If the testing is too expensive for you, then you could check for the reasons mentioned in this article, and if you find you can have a possible chance for dangerous pollution, then I suggest to either fight it or make an air quality test. Will an Air Purifier help with asthma?